RumbaTime Orchard Mini Goldtone Mint Green Crystal and Silicone Strap Watch More than just a timepiece, this gorgeous green watch will turn heads. From the faceted crystal to the cool mint green color, this is a watch that will look and feel like a signature piece. Slip it on and show it off! 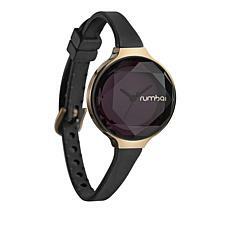 RumbaTime Orchard Mini Rosetone Black Crystal and Silicone Strap Watch More than just a timepiece, this gorgeous black watch will turn heads. From the faceted crystal to the rosetone accents, this is a watch that will look and feel like a signature piece. Slip it on and show it off! When you're wearing a Rumbatime silicone strap watch, you may find that people ask you for the time much more frequently. Each time you look at your wrist, you'll be greeted by the rich, crystal-cut face in a variety of saturated colors. The coordinating slim silicone wrist is a breeze to wear and even easier to keep clean â€” just wipe it with a wet cloth. The elegance of the Rumbatime silicone strap watch belies the durability of this beautiful timepiece. The value price point may have you collecting one in each color to coordinate with everything in your wardrobe. Pair this statement watch with an equally eye-catching statement necklace. Enjoy such bold designs as chunky metal beads paired with rubber cord for a thoroughly modern look, or a beaded crystal bib-style necklace that is a unique, elegant head-turner. Available in every color of the rainbow and a nearly endless array of styles, you'll transform your wardrobe with this powerful accessory. Keep the fun color party going with our collection of celebratory brooches and pins. A gem-encrusted frog pin is a perfect complement to that little black dress. Our wide selection of Heidi Daus crystal and enamel pins brings to life everything from a perfect pink cupcake to the signature light post from the film Mary Poppins. Bring your style up a notch today with HSN's Rumbatime silicone strap watches and our exciting collection of statement jewelry.